With the weekend fast approaching and, inspired by Kate Steffens’ Straight Outta Chocolate Cake collection (as featured on MusicRadar Daily via LA Weekly) - “edible interpretations of album covers and musicians” – MusicRadar has literally had its cake and eaten it. Again. We’ve trawled the far corners of the internet to bring you the best ridiculously detailed, time-consuming and downright crazy musical instrument-shaped cakes we could find. So, sit back, wobble your sweet tooth and scroll through our top 12. The coolest-looking cakes which, where possible, are based on actual products. 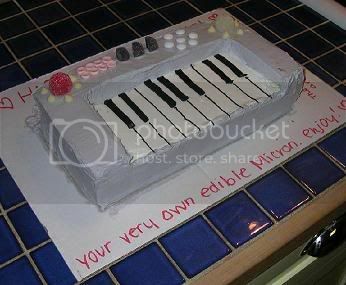 First up: the keytar cake. Debbie from Debbie Does Cakes does custom cakes by the order. You can scroll through her Flickr photostream for more examples but some of our favourites include a Dualcom Multi Outlet cake, a boombox cake and the above keytar masterpiece. NOTE: We’ve discussed the choice of wording on the cake and no, we have no idea what it relates to either. Debbie also makes an impressive turntable cake (with edible headphones and Kangol cap!) but this double setup with mixer by the Yummy Cake Company gets honoured because it’s, well… twice as big. Yours for £275 if you fancy it. No, it’s not strictly a cake, but if a cake shaped like a keytar with the word WANKTRON spelled out on top doesn’t cut it for the big day, take the subtler route with this personalised cake topper from Magic Mud. Also available for drummers, Apple Mac enthusiasts and Guinness-loving guitarists. All weddings should be themed: pirates, vampires, Star Wars or, in the case of Steve and Sharon Patucci, drum-orientated. Related items included a drum card holder, drum-shaped cookie favours and the above: “five tiers of Tiramisu/caramel apple spice bliss in one percussion confection! (the cymbals are made of fondant, FYI)”. This one also made it to MusicRadar’s 17 most outrageous drum kits on the internet round-up. Respect. By Karen Portaleo, cake decorator extraordinaire at the Highland Bakery in Atlanta, Georgia. This one looks a little bit like the kick from a Ludwig Epic Standard Kit. Search for ‘guitar cake’ in Google and you’ll get a billion results. Some are delightfully amateur, some look more like violins but we’ve trawled a few million to pick the neatest-looking. First up: Fender Strat cake by Alixs Cakes (unfortunately, the strings are not edible). This could be any number of acoustic models (although the flat, wide shoulders suggest an Auditorium/000 shape) but the intricate string details (many opt for real strings, these are edible!) makes this particular cake a well deserved entry. Created by Small things Iced. Created by Sweet Retreat, this cake was modelled on a Gretsch White Falcon, is “made of a moist vanilla cake with a creamy vanilla filling” and “took 10 hours to complete”. It features a personalised Bigsby and edible gold controls. A little something for the 4-stringers. You can just about make out the Rickenbacker logo on the headstock but, even if you couldn’t, anyone calling themselves a guitarist could work it out. Designed for a guitar-loving, Arkansas Razorback Hog fan by Cakes For Sam. This Vox Valvetronix amp cake comes a close second. 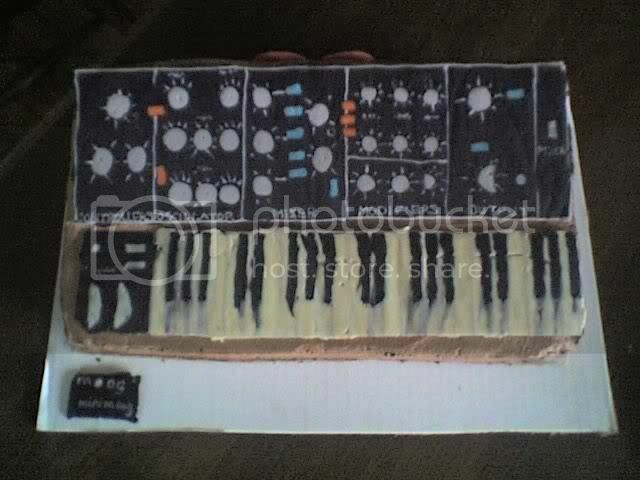 Via MusicThing: “I was delighted to hear from Benjamin, who writes: "My friends in the band Freezepop had a synth-cake party and they made this awesome SH-101 cake”.